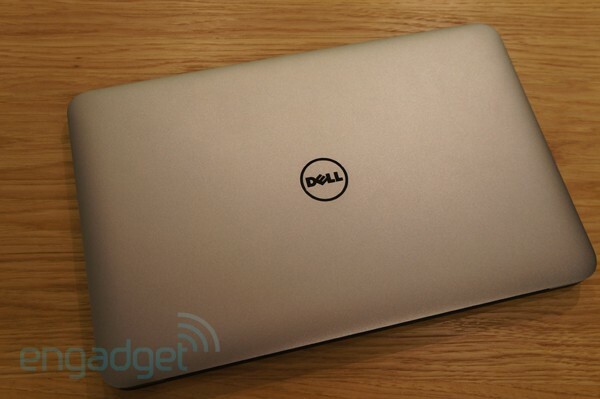 You didn't think Dell was going to sit out the Ultrabook fad, did you? We'll never know exactly what the hold-up was, but whatever the company's excuse it finally has something to compete with the likes of the MacBook Air and ASUS Zenbook UX31. The company just announced the XPS 13, which weighs in at a shade less than three pounds (2.99, to be exact) and has a wedge profile that tapers from .71 inches to .24 (18 to 6mm). With a starting price of $1,000, it sports an aluminum lid and carbon fiber chassis -- a material we wish more Ultrabook makers would incorporate. Though it has a 13-inch screen, it's the kind of panel with bezels so narrow that Dell was able to build a chassis small enough for a 12-inch system. 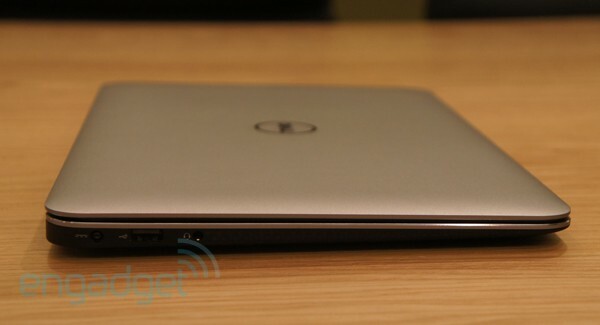 Put bluntly, expect this to be one of the most compact Ultrabooks around (though not the lightest). What's that? You want technical details too? At the entry level, it'll come with a Core i3 i5 processor, 128GB SSD, 4GB of RAM and backlit keyboard, though you'll also be able to upgrade to a 256SSD and either a Core i5 or i7 CPU (Sandy Bridge at launch, with Ivy Bridge to follow in a refresh later this year). Other specs include a 300-nit, 1366 x 768, Gorilla Glass display; Intel HD 3000 graphics; a 47Wh battery rated for up to eight hours; Bluetooth 3.0; and Intel's Smart Connect and Rapid Start technologies. As HP is doing with the Folio 13, Dell plans to sell this in both its consumer and business channels; accordingly, the machine will be offered with TPM, asset tagging, corporate images and custom BIOS to keep the IT guys happy. It'll be available at the end of February, but if you need to know as much as you can now, we've got hands-on photos below, along with impressions after the break. This time around the aluminum cover is a slightly darker shade of gray (think pewter), but it's underneath the lid where Dell re-tooled the XPS aesthetic. This time, the entire deck is black, not silver, though the wide (and rather controversial) font on the keys hasn't changed. The hinge is still made of metal, though this time it's a solid piece that doesn't call much attention to itself -- a far the ridged hinge on the 14/15z. 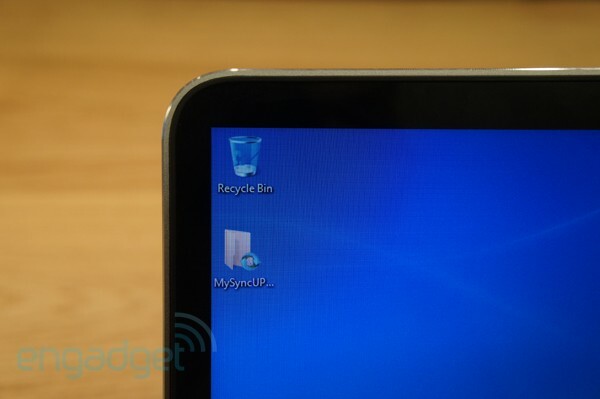 Dell's also moved to a clickpad, which, if nothing else, makes for a more streamlined look. Overall, the design is worlds more reserved than the XPS laptops you know and judge -- other than a thin chrome band ringing the chassis, there really aren't many flourishes marking this as a premium system. But then you pick it up. As understated as the XPS 13 looks, it feels like a premium system, with its smooth aluminum lid and tough carbon fiber chassis. We were especially taken with the soft rubbery coating on the bottom side, and thought the subtle pattern there was a nice touch. Most importantly, though, it's more compact than other Ultrabooks we've handled -- a point that will be especially salient during this year's CES, where quite a few companies will be showing off 14-inch Ultrabooks with optical drives (optical drives!). As you can see in the comparison shots we took with the 13-inch MacBook Air, Acer Aspire S3, Samsung Series 9 and Dell XPS 14z, the XPS 13 isn't necessarily skinnier or even lighter than its brethren, but it at least has a more condensed footprint. We can't help but feel underwhelmed by the XPS 13's port selection. It starts off on the right track: USB 3.0 and 2.0 ports, the latter of which has so-called PowerShare technology for charging gadgets while the computer is asleep. So far, so good. The laptop also has a Mini DisplayPort, audio jack and 1.3MP webcam. And... that's it. No HDMI, which you'll see on most every other Ultrabook, save for the ASUS Zenbook UX31. And no memory card slot. Truly, we were hoping Lenovo would be the only company to make this mistake, but it looks like we need to repeat ourselves: lots of consumers need this feature. Not a niche group of customers, mind you, but anyone who owns a camera and regularly takes photos. And it's not like space constraints are a good excuse either: the MacBook Air manages to cram in an SD slot, and it's markedly thinner than the XPS 13. Though Dell gave the XPS' backlit keyboard a paintjob, it was wise enough not to muck with the design. These are the same sturdy, pillowy keys we loved so much on the 14z. True, we haven't spent much time with it now that it's been cut down to fit a much smaller chassis, but we at least feel confident that it's less shallow than what you'll find on most other Ultrabooks. 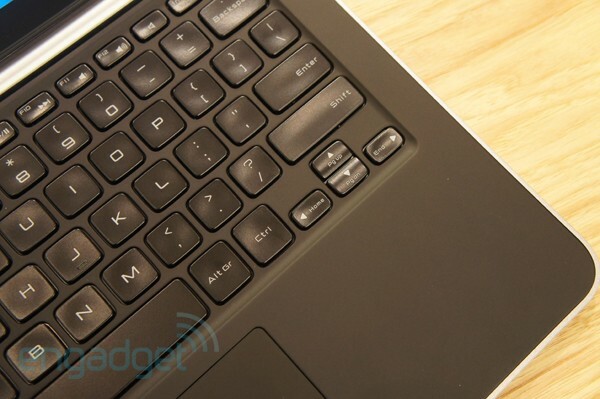 We won't lie: it makes us a bit nervous that Dell moved away from discrete touch buttons and opted instead for a clickpad. It makes for a more modern design, sure, but the buttons on the XPS 14z were easy to press, and we didn't have to suffer the foibles of a flaky trackpad that stumbles over multi-touch gestures and frequently mistakes left clicks for right ones. For now, though, we have no choice but to reserve judgment, since the XPS 13 we saw last month was a pre-production model with not-final drivers. In some ways, we can see the XPS 13 being a hit in the style of the HP Folio 13: it's a tasteful machine offering some good specs for the money and a host of IT-friendly perks. Still, the XPS 13 starts at a higher price than either the Folio 13 or Toshiba Portege Z835, but has fewer ports, with a couple major ones MIA. That said, this wouldn't be the first time we found use for an Ultrabook without an SD slot: after all, the Lenovo IdeaPad U300s has a timeless design, fast performance and a comfortable keyboard-and-trackpad combo. Ports are nice, but they don't need to be deal-makers for everyone. On that note, then, we'll be keeping an open mind until we can put this guy through its paces.